Date & start time: Thursday 8th April 2010, 11.25 am start. 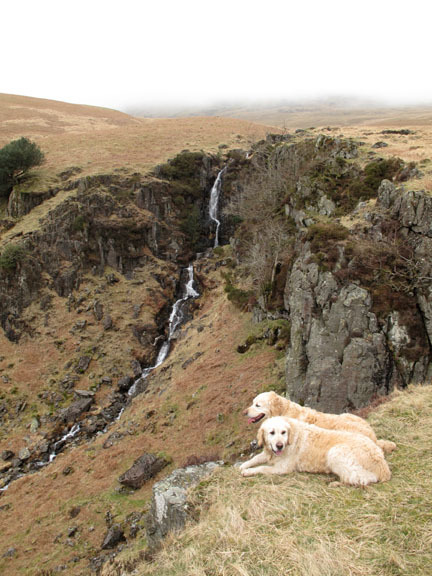 Places visited : Miterdale Forest, Irton Fell, Whin Rigg, Illgill Head, Burnmoor Tarn and back down the Miterdale Valley. 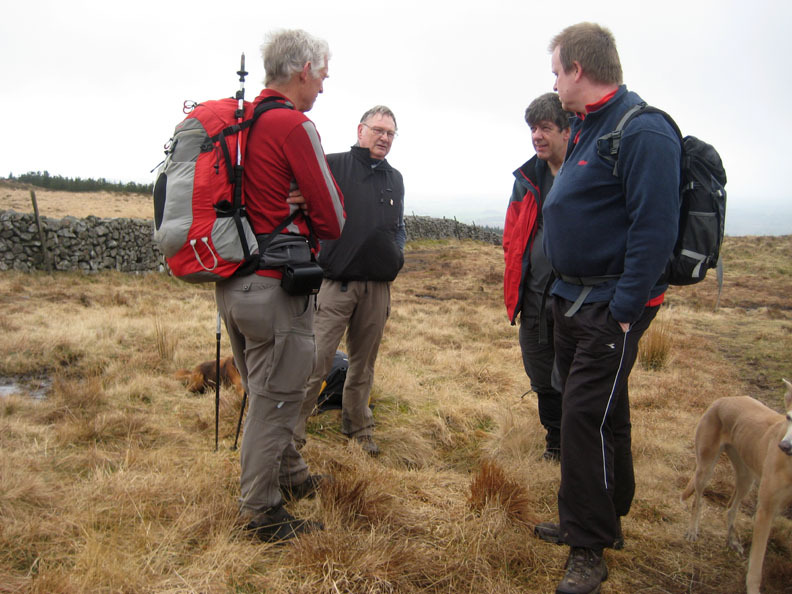 Walk details : 8.8 mls, 2060 ft, 6 hrs 20 mins including lunch. 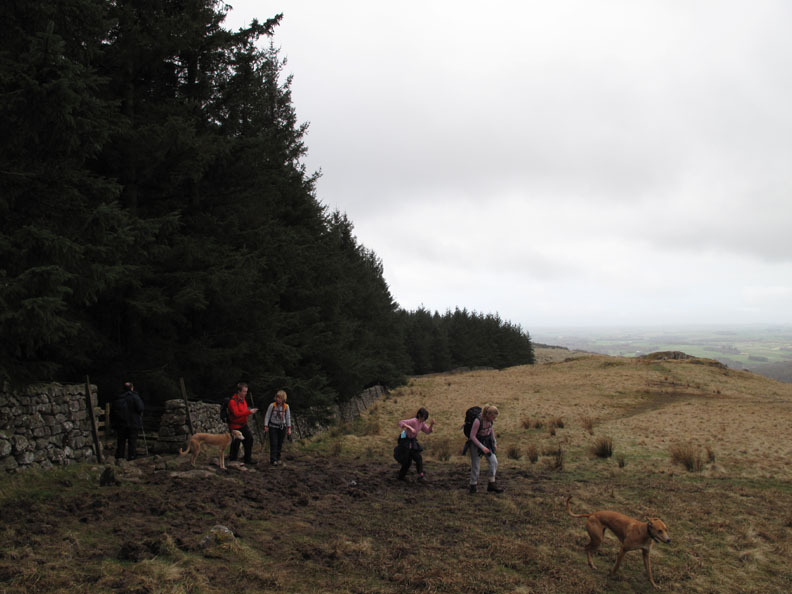 Walked with : Ian & Megan, Simon & Beth, Neil, Jo, John, Ann and the dogs, Jodie, Amber, Polly, Harry and Bethan. Weather : Inclement . . . i.e. 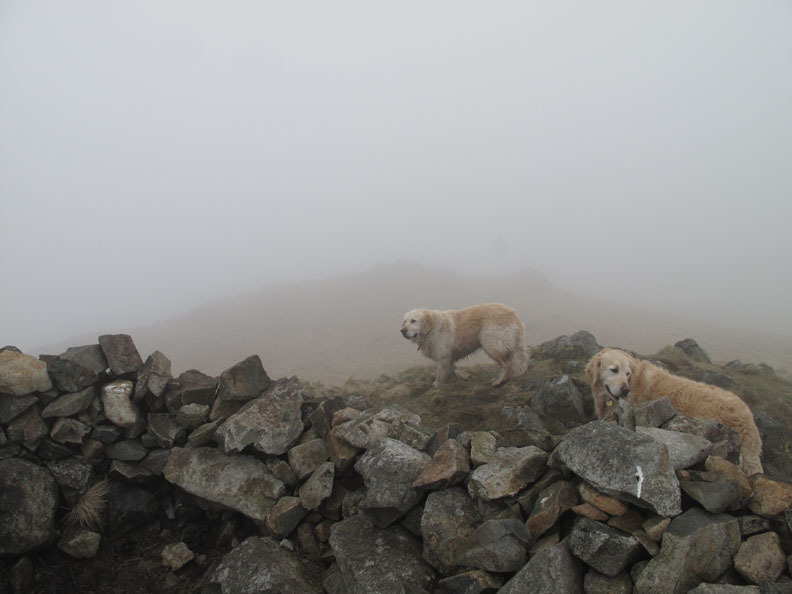 overcast with cloud down on the high fells . . . much as forecasted. 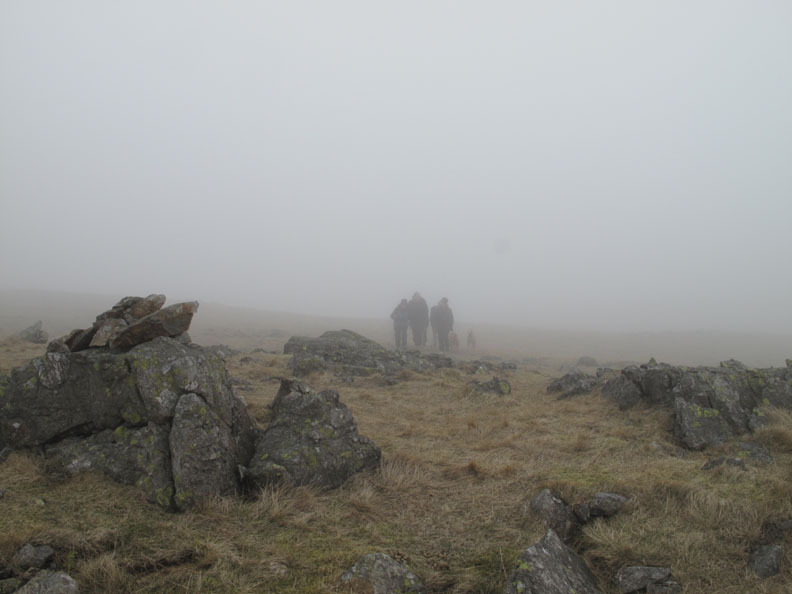 An unofficial OFC outing found nine of us in Eskdale on a day when the weather was less than clement. 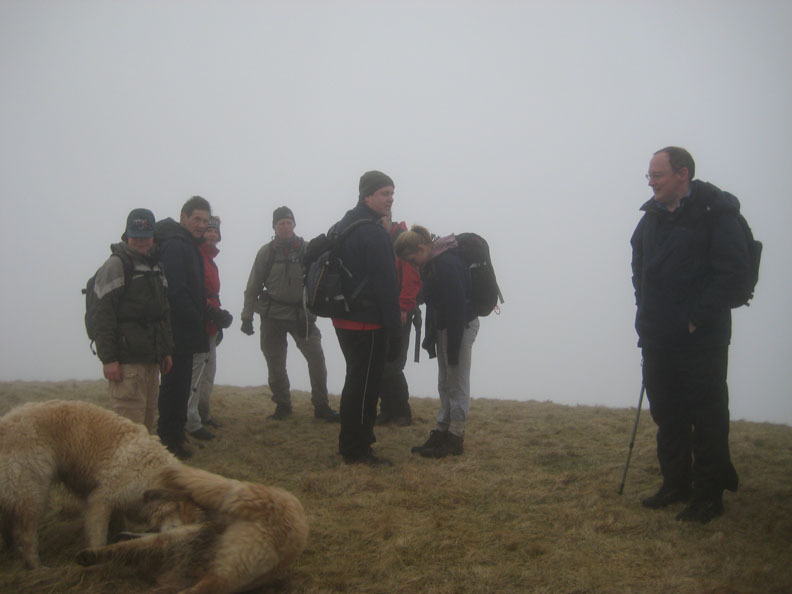 After an eventful start the walk progressed normally apart from one or two more unusual events. 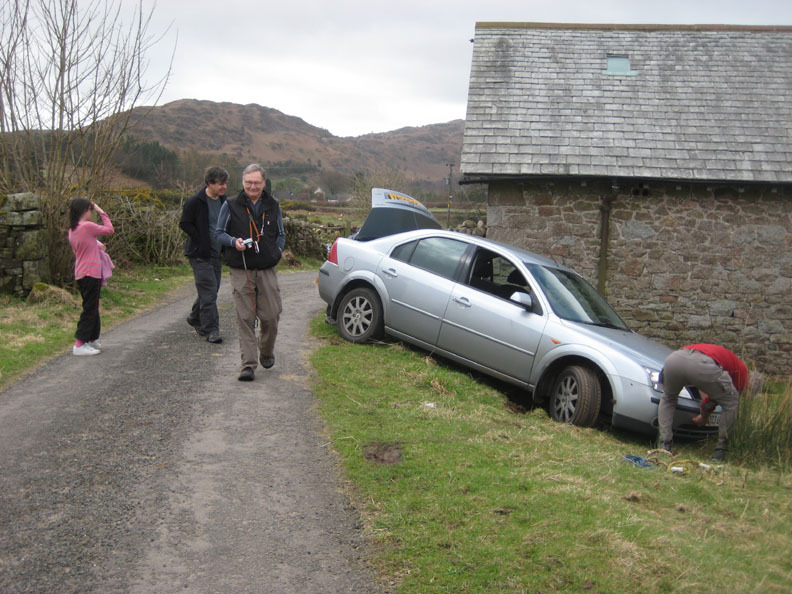 we saw a car parked rather awkwardly off the road, so we stopped to help. who had kindly reversed to let someone past, only to find the front of the car sliding sideways down the roadside verge. 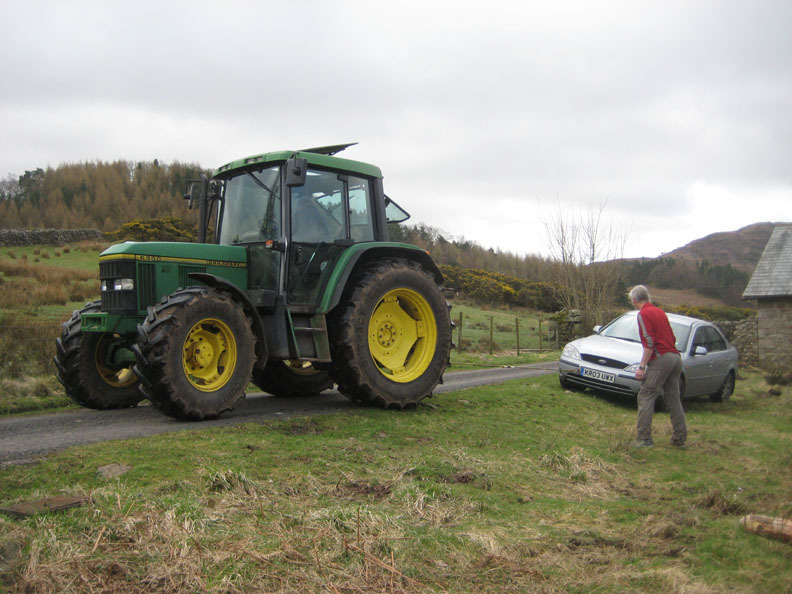 Still with the help of a friendly local farmer Ian arranged a tow . . .
. . . and he was soon back and on his way. 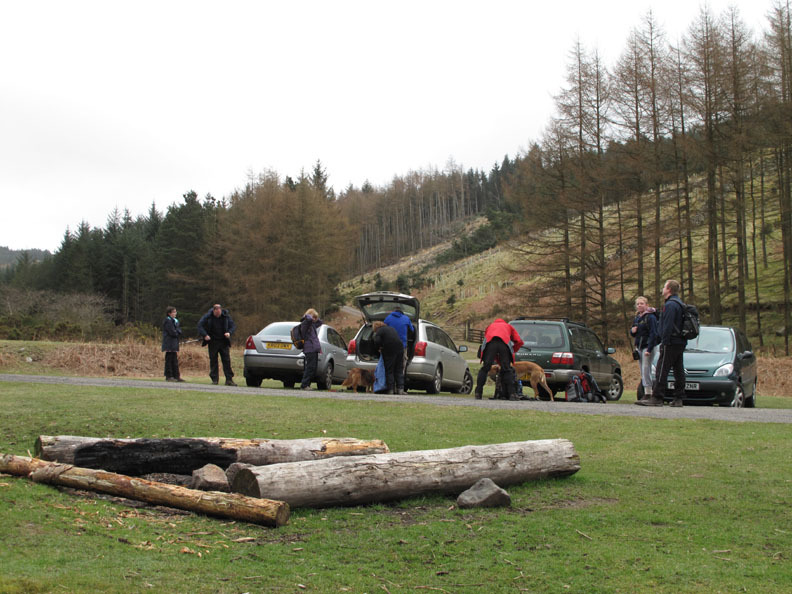 we all arrived at Porterthwaite road end car park. Today's group . 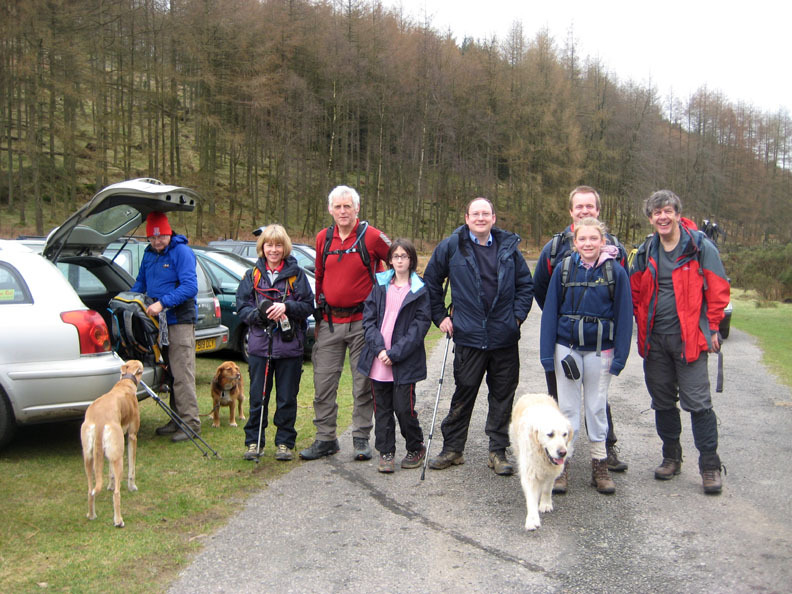 . .
(l to r) John, Jo, myself, Megan, Ian, Simon, Beth, Neil with Ann as photographer. 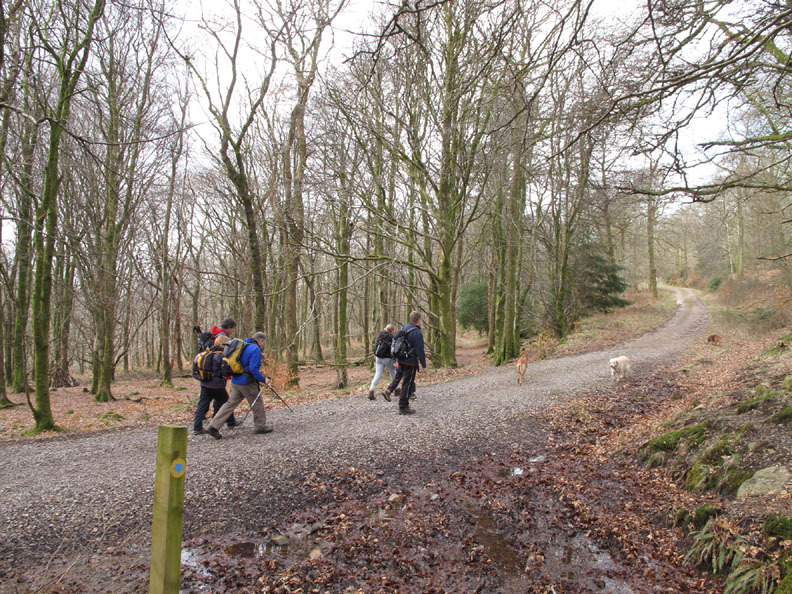 heading up the forest tracks towards Irton Fell. 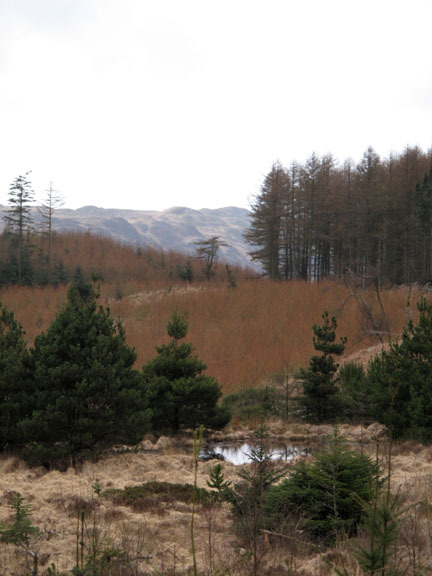 The crags of Green Bank stand out amongst the forestry. The trees have re-grown since our last visit in 2007. 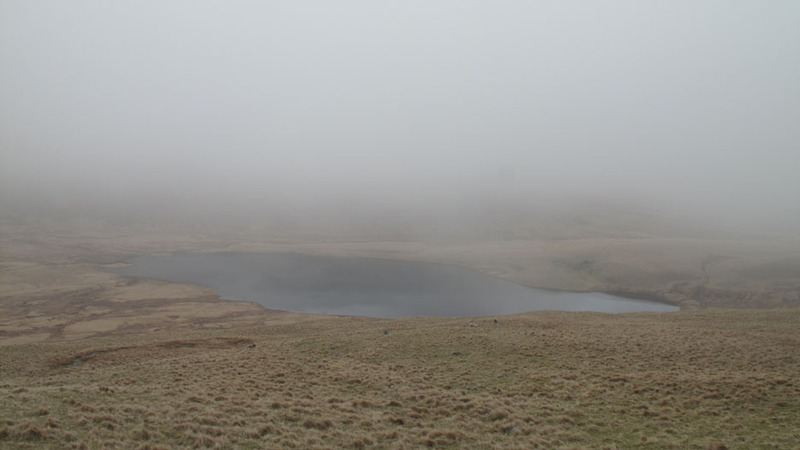 Above the pool in the photo is Muncaster Fell, but poor visibility meant we had virtually no views of the sea at Ravenglass. 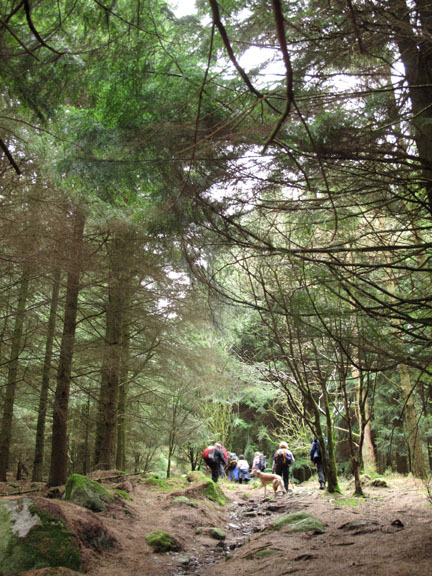 Working our way up through the mature forest towards the open fell. 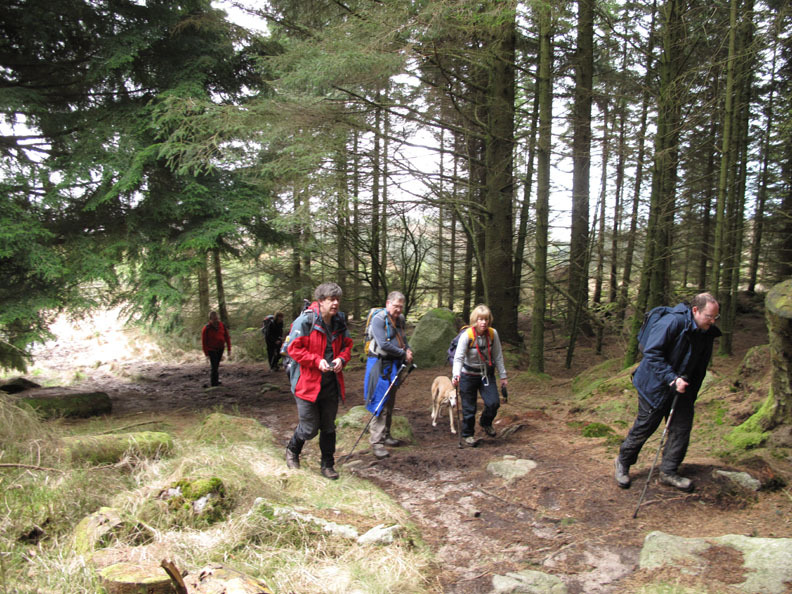 Ian leads with Neil, John and Jo close behind. 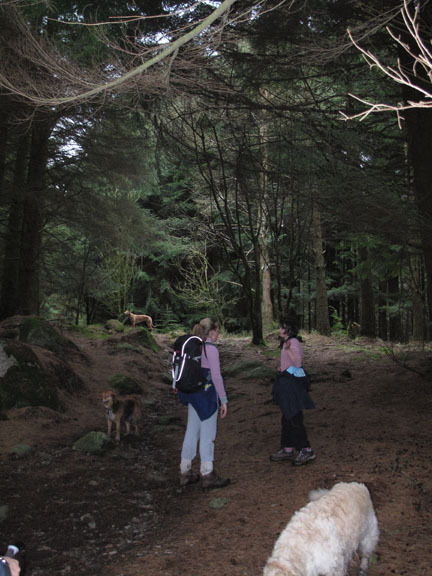 Beth and Megan were delighted to meet up on a walk again. 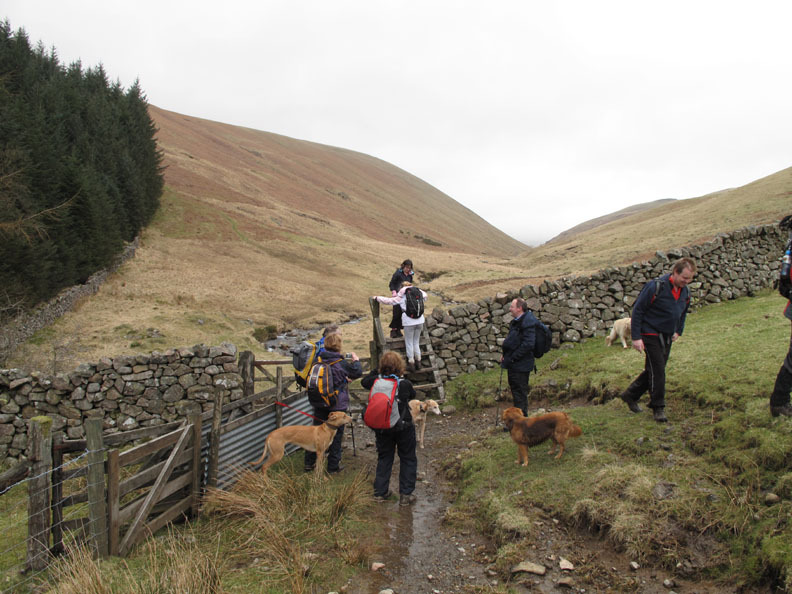 Suddenly the trees ended and we reached the fell gate leading out onto Irton Fell . With the heavy winter snows and recent rains the ground was officially declared 'heavy' . . . In real terms that means soft, muddy and wet in places. 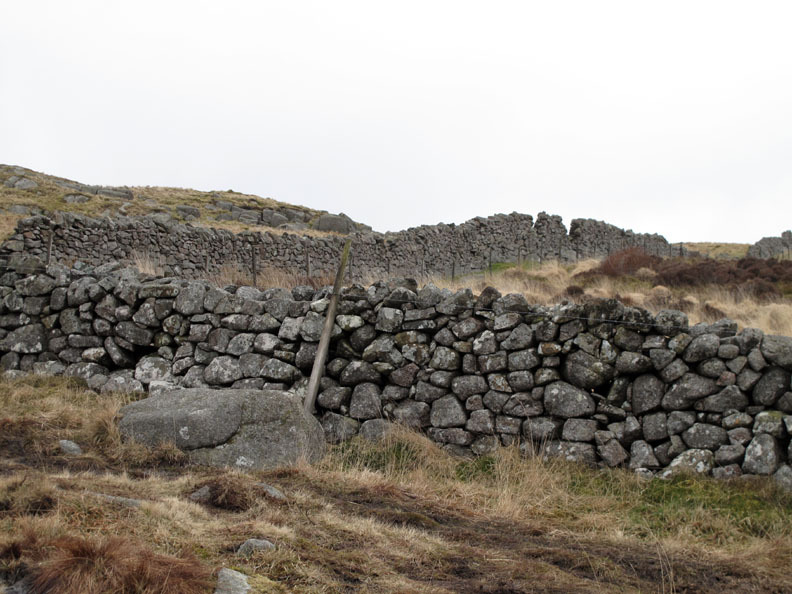 The granite boulders gives a different type of stone wall here compared to the flat slates of the North Western fells. 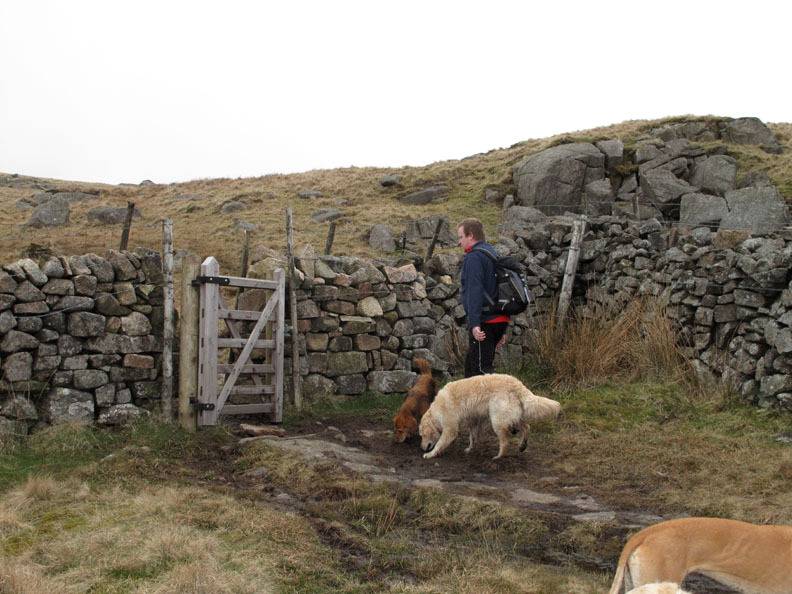 Simon reaches the gate to the next section of moorland. Ah . . . time for an important conference - a serious 'man talk' ! 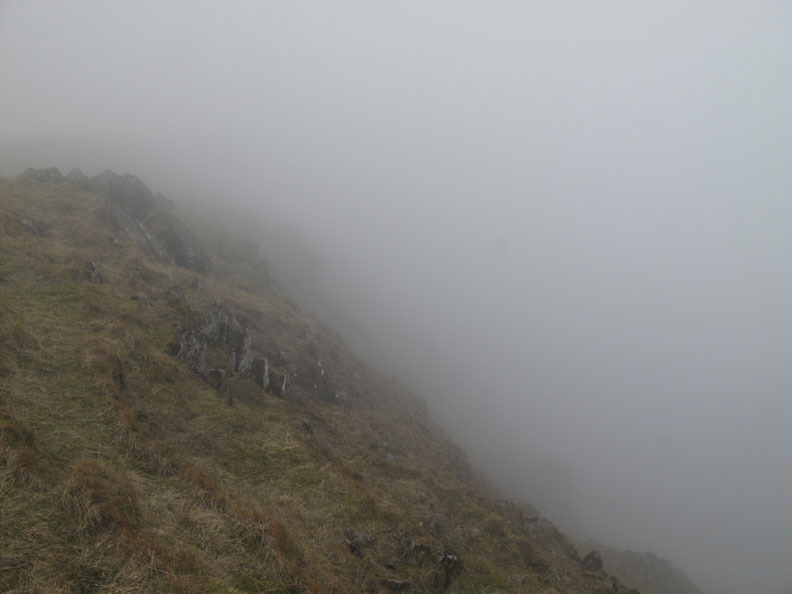 The last full view we had before we climbed into the mist. 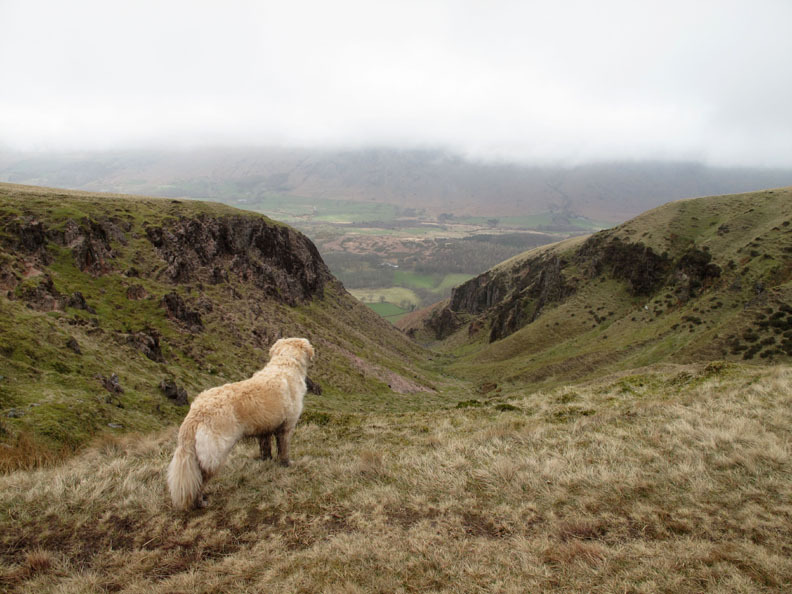 Harry is looking down Great Hall Gill towards Woodhow Farm and the Wasdale Youth Hostel far below. 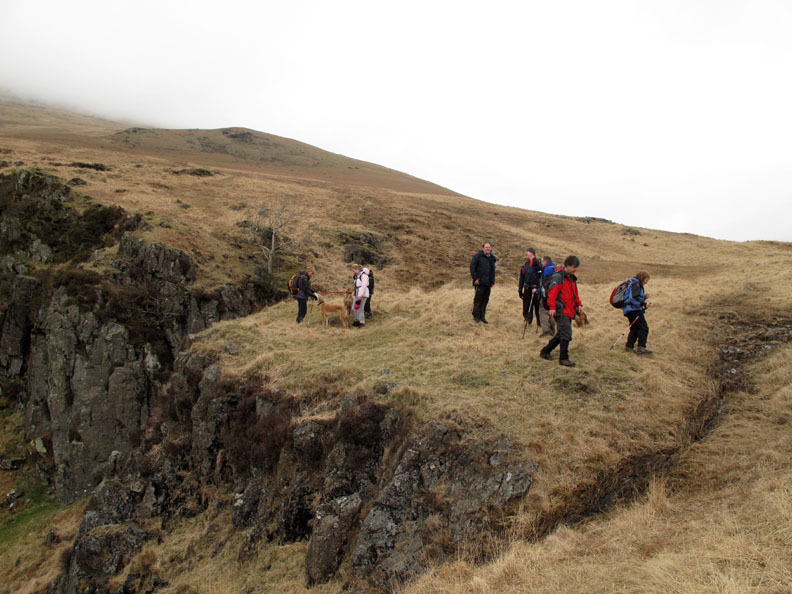 but in fact the highest rocky outcrop of Whin Rigg summit is off to the side of the path some 50 yards or so.
" 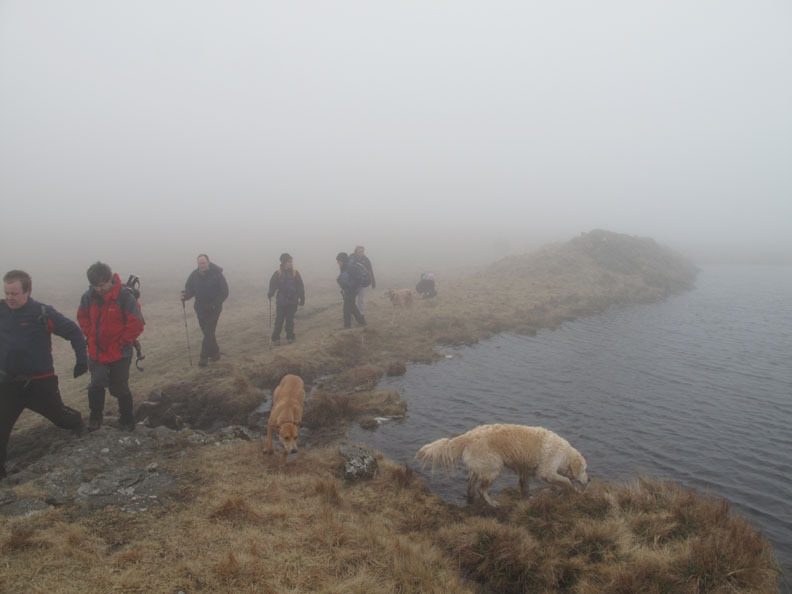 Off into the great unknown "
reaching the small tarns between Whin Rigg and Illgill Head just as planned.
" Anyone else fancy a swim ? " or perhaps he's saying " Isn't anyone going to throw me a stick ? " down the crags of the Wasdale Screes to the (hidden) lake below. 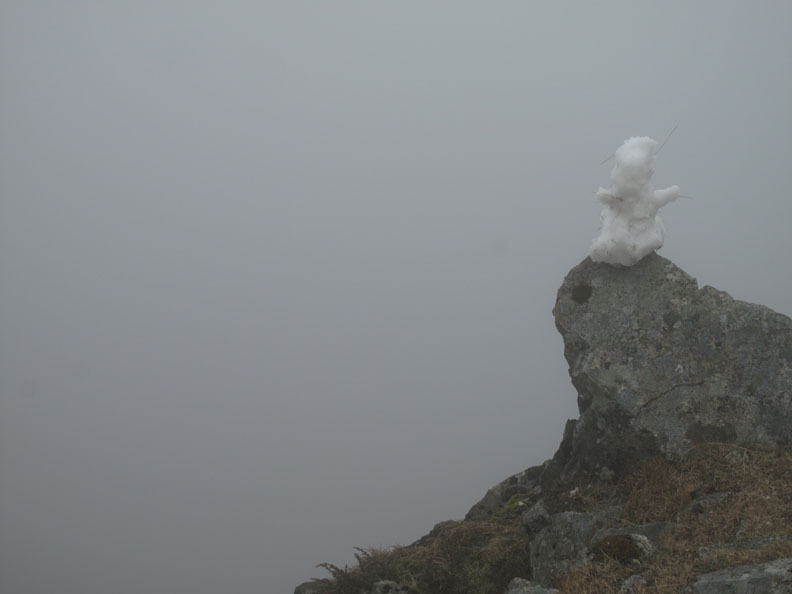 Then came another surprise . . .
. . . a large patch of snow and a "Base Jumping" snowman . . .
opening his parachute on the way down to allow himself a safe landing. If you don't believe me . . . hold your cursor over the photo ! 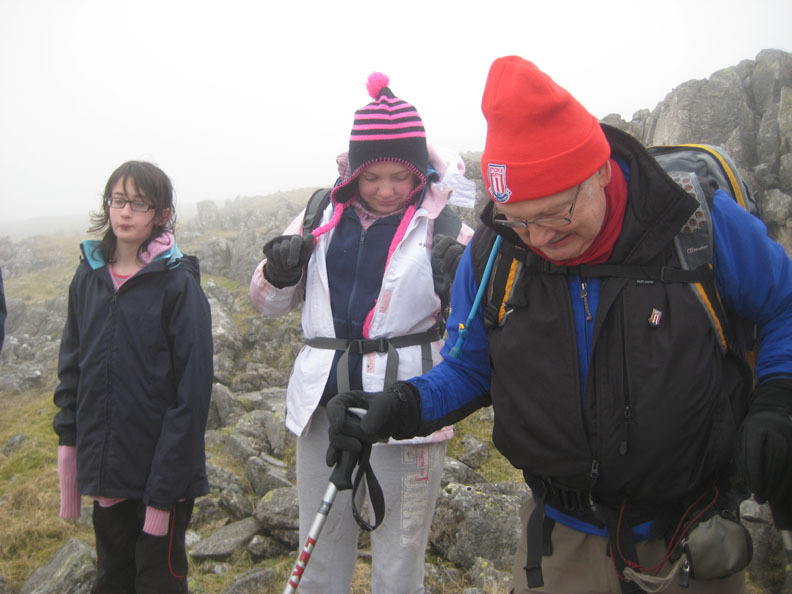 and chatted to a family from Fylde near Blackpool who were up here on holiday. 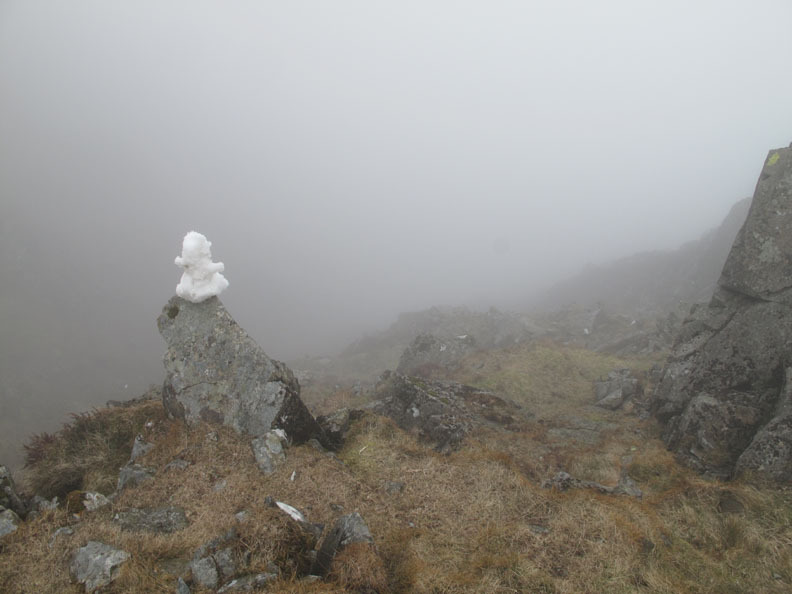 this time it was the last rise to the top of Illgill Head. Click here or on the photo above for a wider annotated panorama. 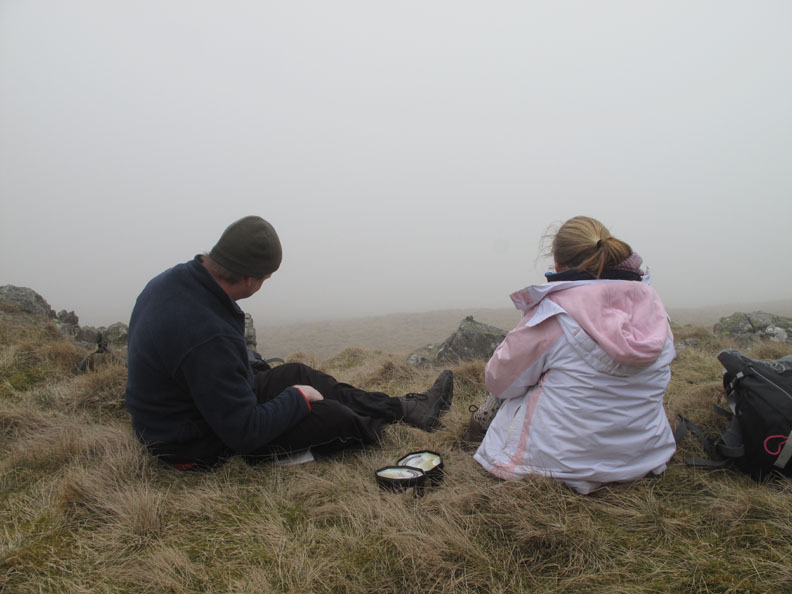 We stopped for a bite to eat and Simon and Beth have a secret . . .
Those look like ice cream boxes . . . how come they kept that a secret ! 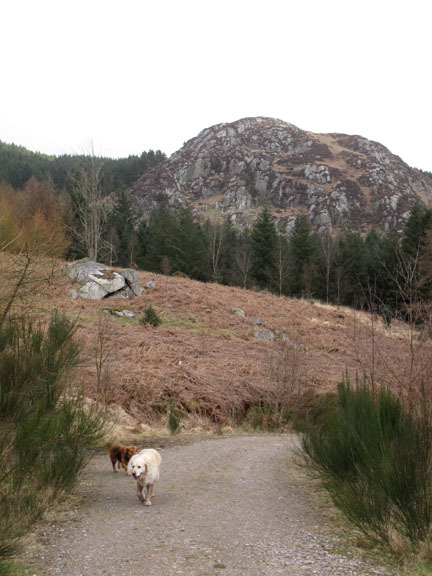 we gathered our belongings, our children and our dogs and headed off on the next leg of our walk. 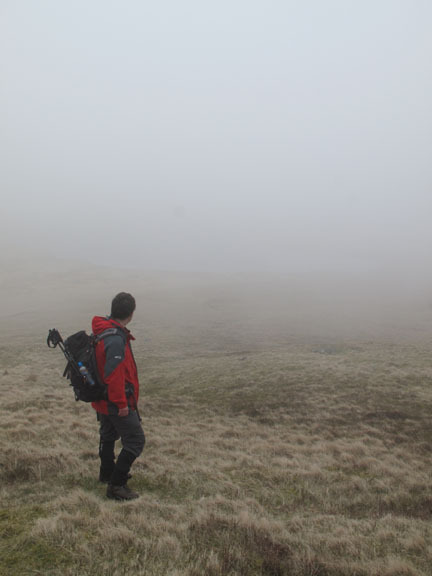 Neil looking down on our route to Burnmoor Tarn. 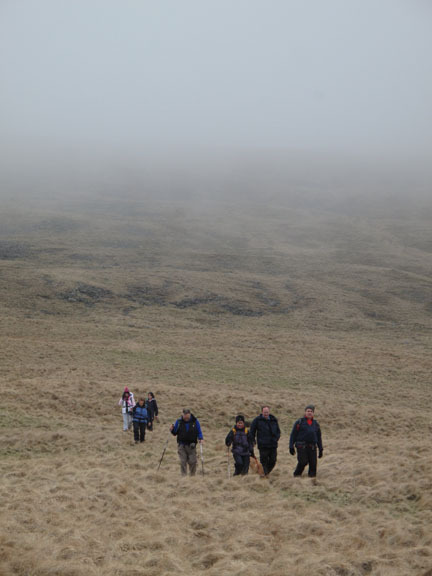 Leaving the mist behind we reach the lower ground. Below us and in view for the first time today . 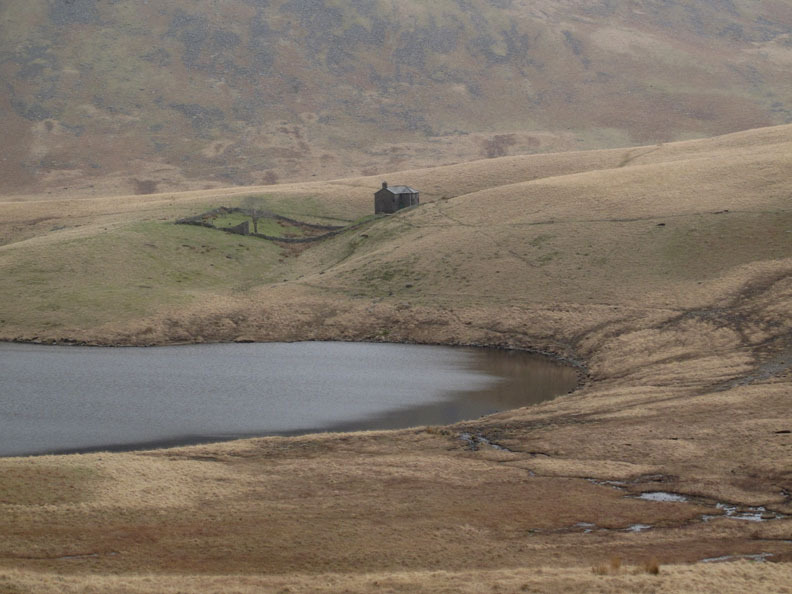 . . Burnmoor Tarn. 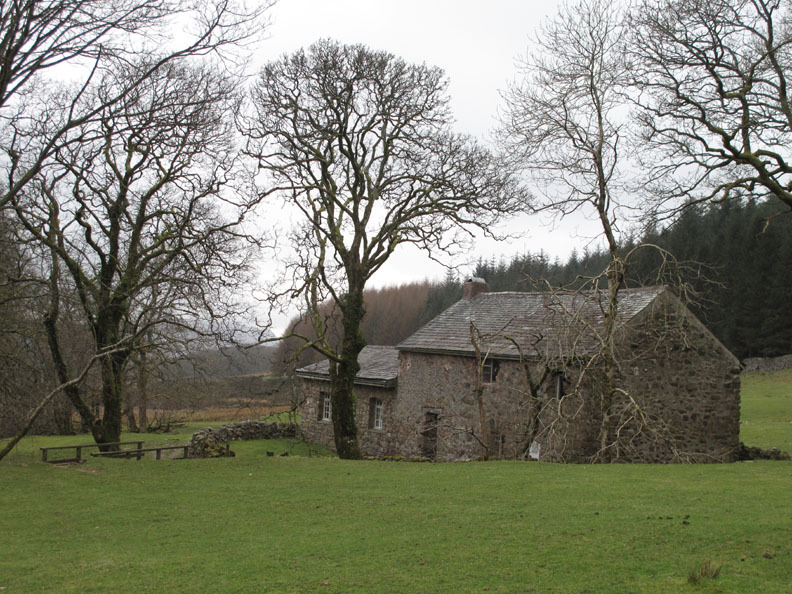 On the other side of the lake is Burnmoor Lodge, originally a game keepers lodge and in use when the moors were stocked with Grouse. It has been owned by a Nottingham gentleman and used as a hostel for a Christian Youth organisation. 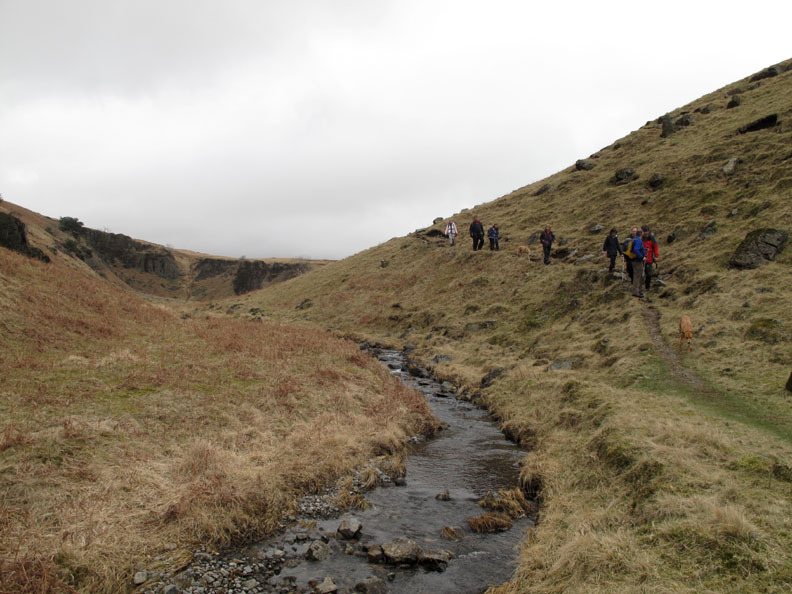 We drop down from the side of Illgill Head to the top of Miterdale Valley. despite the small stream and waterfall that flows into it. 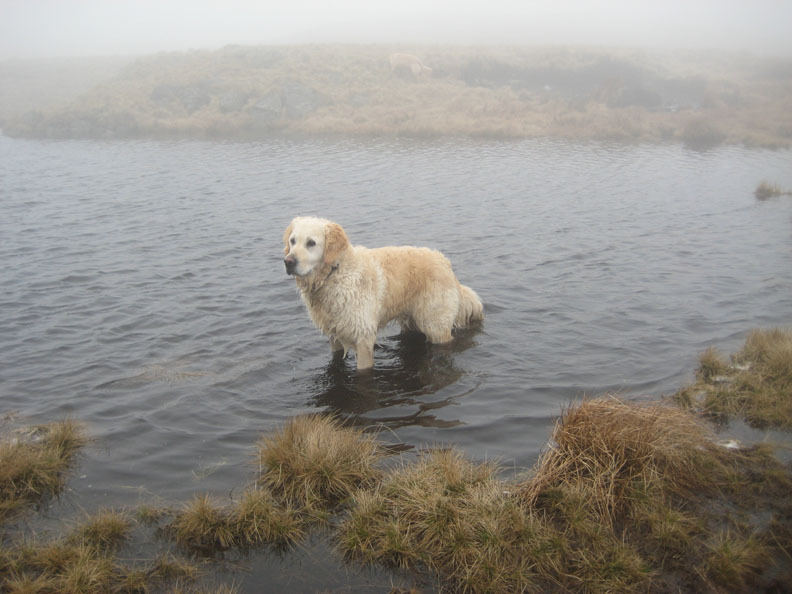 flowing out of Burnmoor Tarn in post glacial times. to be drained by the infant River Mite you can see here. 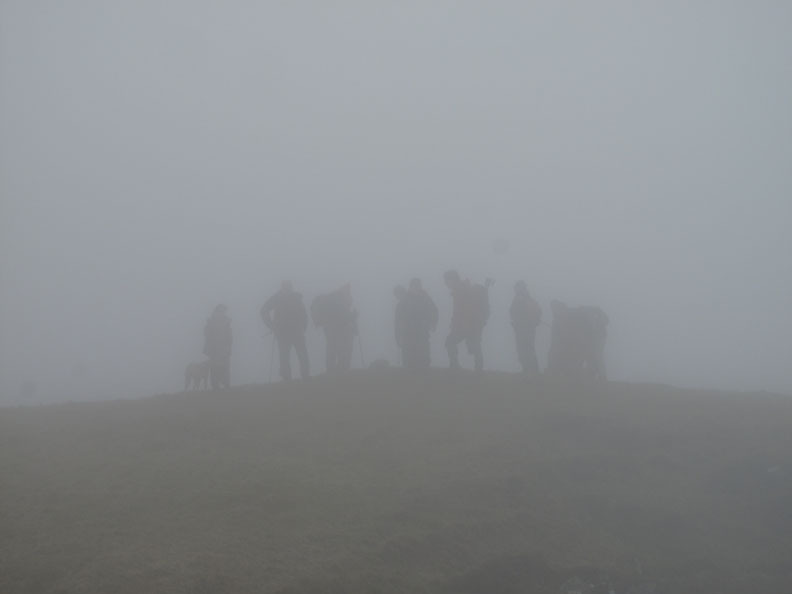 Crowd scene at the head of Miterdale. 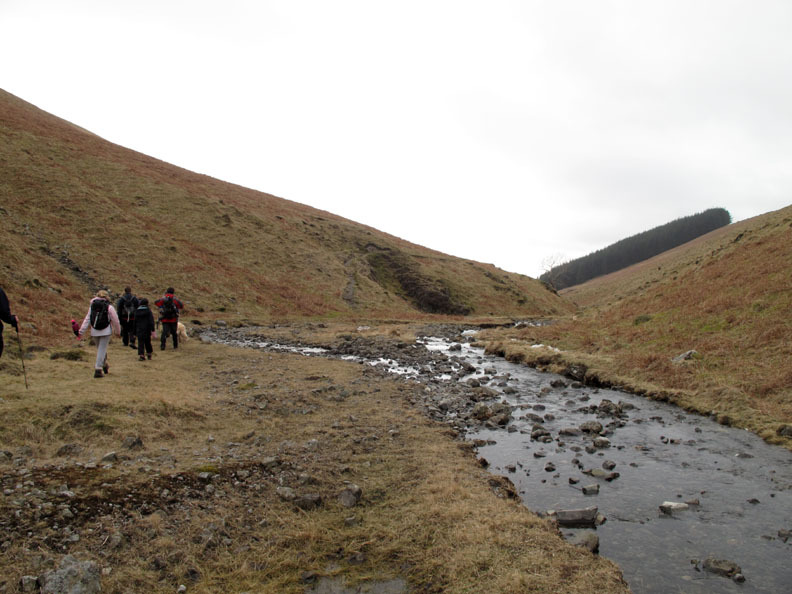 To enjoy the valley to the full, we took the track down to the stream. 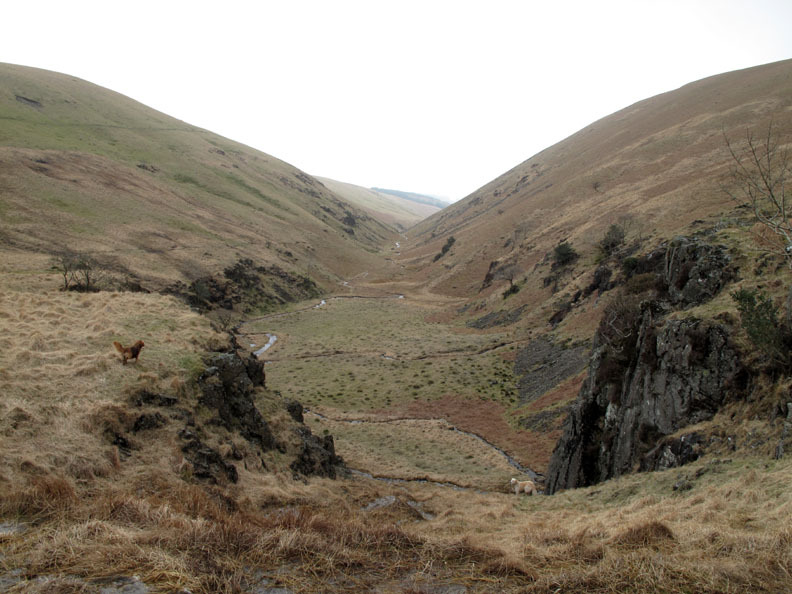 The high level path, which we used last time, cuts down to the valley by the distant trees. Over the ladder stile in the fell wall, the gate having been bolted to keep it shut. 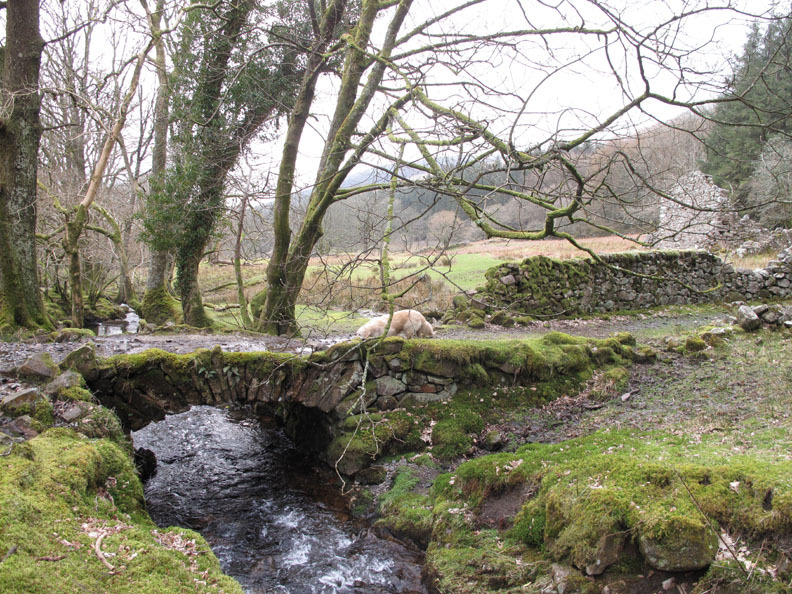 A delightful and small packhorse bridge (no parapets) near the old Miterdale Head farm. 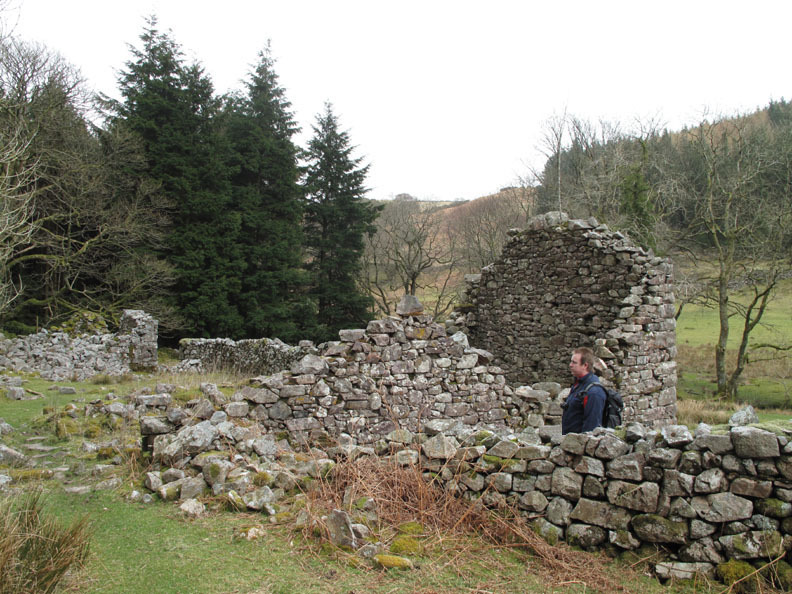 Simon checks out the old ruins of this once extensive property. 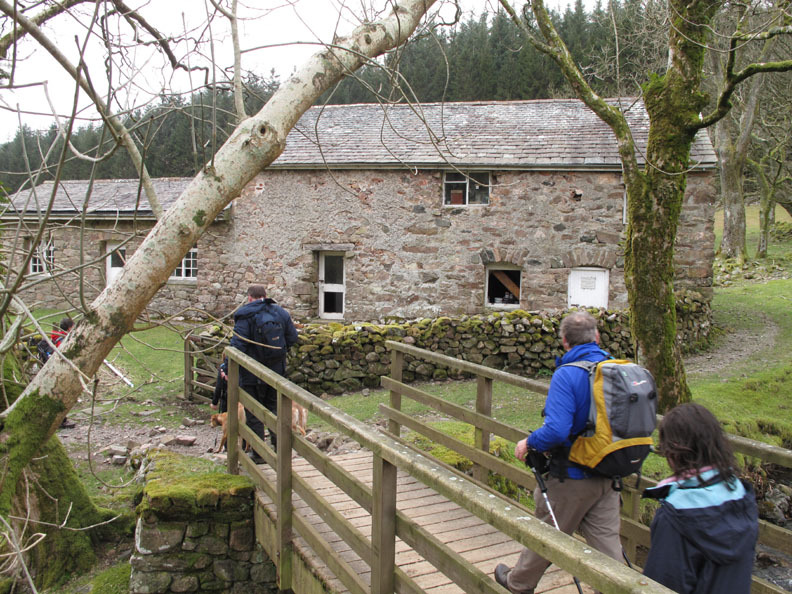 The next house down is the Bakerstead Barn, outdoor pursuits centre . . . but all is not well. and is fast falling into disrepair. 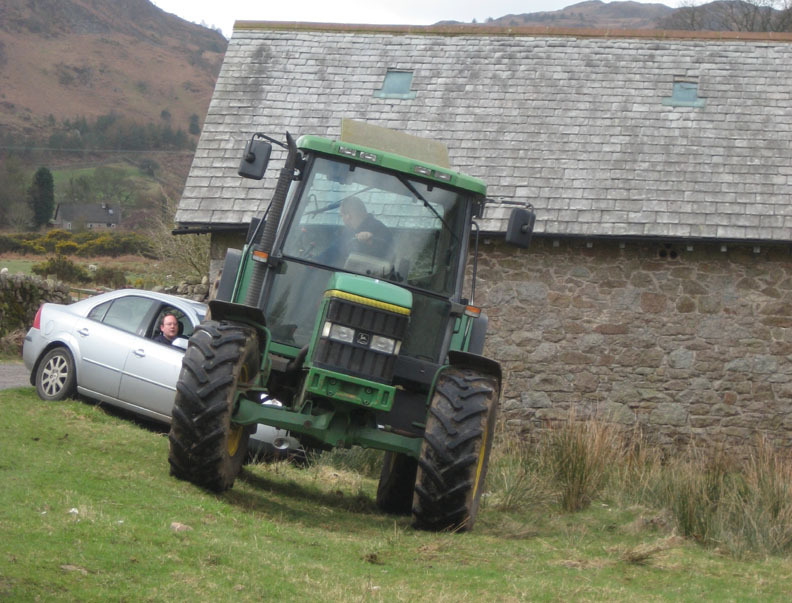 This was in fact a typical cumbrian farm. People living above animals. I worked on the renovation of the building in the 1960's. We (a small group of one teacher and some pupils) worked every Sunday morning, wall building, installing toilets etc. The left most side was roofless when I stopped working there. The buildings you called the ruins of bakerstead farm are in fact the ruins of bakerstead Hamlet - which included a brewery at one point. Geoff Marshall, pupil at Wyndham school 1965 to 72. Thanks Geoff . . . there's more to life than meets the eye. I'm pleased to record the information for people to see . . . RmH. 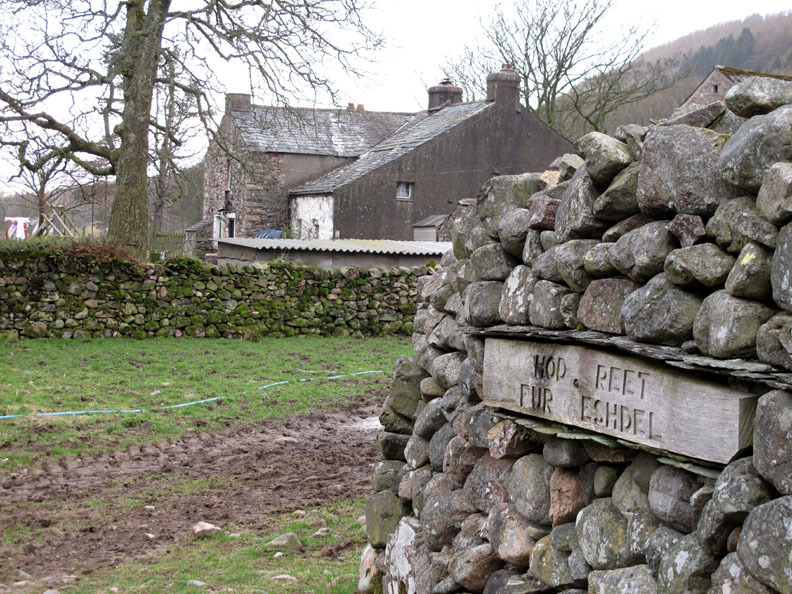 in broad Cumbrian, "Hold or head right for Eskdale"
Their Farm yard however is just as muddy as ever and hasn't changed in years. 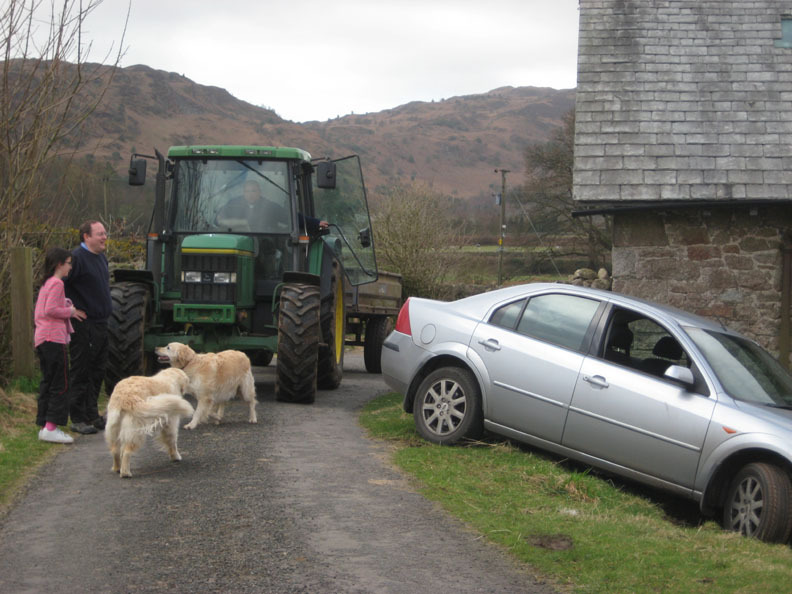 It was just a short walk down the valley on their farm road and we were back at the car. This site best viewed with . 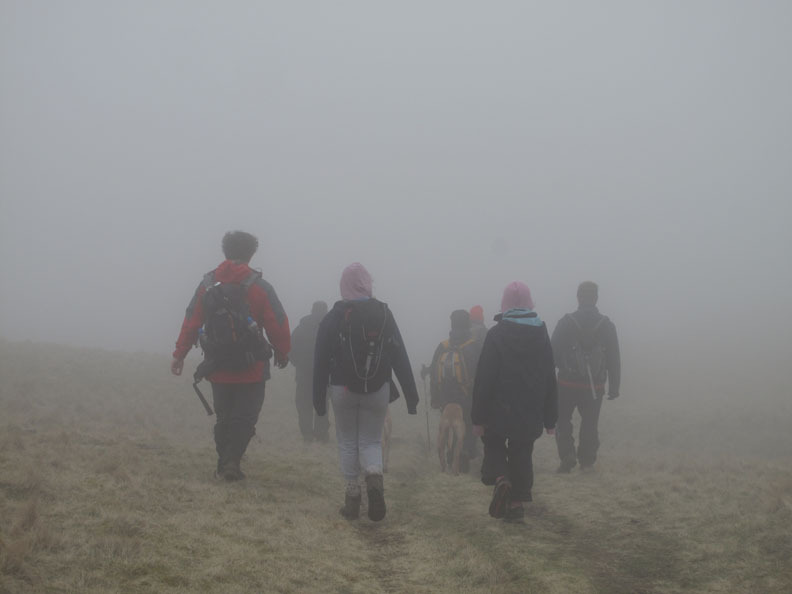 . . a map and a good eye for the path up there in the mist.